Many adults have little (or false) information about the medicinal use of cannabis. Many of these misconceptions about medical cannabis (especially among senior citizens) center around their exposure to propaganda touting the negative influence of cannabis. Listed below are what we refer to as The Baker’s Dozen of Medical Cannabis Facts. 1. Medical cannabis is SAFER than many commonly prescribed medications. Contrary to many beliefs, cannabis does not have significant side effects and there have been no cannabis reported deaths. Prescription drugs have numerous side effects and in many cases such as opiate based pain killers, can lead to addiction and overdosing resulting in death. 2. Scientific trials confirm cannabis as an effective treatment for a large number of physiological and psychological conditions. The targeted effects of specific chemical components (particularly cannabinoids and terpenoids) and the entourage effect of these components is supported by significant scientific research (corroborating massive amounts of anecdotal evidence) supporting cannabis as an effective treatment for relieving nausea, spasticity, seizures, appetite loss, certain types of pain, anxiety, depression and other debilitating symptoms. 3. Medical cannabis may be an effective preventive treatment for a number of serious conditions. A number of trials in the past decade, indicate that low dose consumption of cannabis containing both THC and CBD may be an effective treatment in the prevention of: a wide number of cancers; dementia and Alzheimer’s; and the progression of a number of auto-immune disorders. 4. Cannabis can reduce and possibly replace many prescription medications. A major complaint of seniors is the cascade effect of daily medications (i.e. one pill causes side effects that a second one is prescribed to “fix”). Targeted use of cannabis has the potential to both replace and/or accentuate the effects of many commonly prescribed drugs. For example, opiate based painkillers are typically enhanced when cannabis is used concurrently, often resulting in a reduction of the pharmaceutical opiate medicines. 5. Cannabis is generally not physically or psychologically addictive. Many adults fear that if they start using cannabis they will become addicted. To date, there have been no deaths in the world attributed to cannabis use and the risk of addiction is less than that of tobacco, alcohol, caffeine and sugar. 6. There are cannabis strains without “the high”. Not all cannabis strains contain cannabinoids that trigger psychoactive effects. 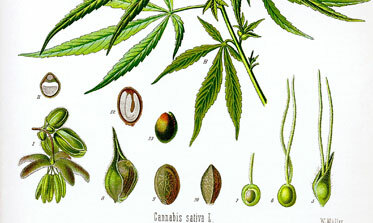 Cannabinoids (such as CBD or CBG) are two such cannabinoids. Both CBD and CBG are extremely effective as: anti-inflammatories; analgesics; bone growth stimulators; muscular spasm suppressants; anxiety reducers; and stimulants increasing mental focus. 7. Cannabis may be smoked, vaporized, applied sublingually, spread topically or ingested. One common misconception among aging adults is that they have to smoke Cannabis to gain the medicinal benefits. Cannabis is available in a wide variety of forms and may be consumed using a number of different delivery methods. Popular alternative forms include: tinctures, concentrates, topicals, medibles and e-canna liquids. 8. Cannabis does not lower your IQ or cause brain damage. There is no scientific evidence that shows that cannabis reduces or “kills brain cells.” Studies with Alzheimer’s and Parkinson’s patients indicate that cannabis gradually encourages new neural pathways, allowing those with impaired brain function to potentially halt further degeneration and even encourage brain function. 9. Cannabis can help regulate your weight or stimulate your appetite. One of the most dangerous health risks among senior citizens is a loss of appetite and subsequent weight loss. A study published in the American Journal of Epidemiology established a connection between cannabis use and body weight; showing that rates of obesity are lower by roughly a third in people who smoke cannabis at least three times a week, compared with those who do not use cannabis at all. 10. The stigma around medical cannabis use is fading. Seniors are the fastest growing population of new medical cannabis users. Medical cannabis provides effective relief for a wide variety of symptoms without the long-term negative physiological effects of many pharmaceuticals. Medical cannabis can be a valuable tool in your “wellness toolbox”. 11. The legalization of medical cannabis results in reduced crime. Studies in every state (including a comprehensive report by Rand) that has legalized medical cannabis on whether the presence of cultivation and dispensing facilities impacts both violent and non-violent crime rates overwhelmingly show dramatic decreases in overall and neighborhood specific crimes. 12. The legalization of medical cannabis results in a reduction in deaths due to opiate overdoses. On average, in states that have implemented viable medical cannabis programs, the rate of deaths directly attributable to painkiller overdoses has decreased upwards of 25%. The longer the state has had a viable program, the greater the impact on reducing deaths—with some states (those who have had medical programs longer) showing over a 30% decrease in deaths. 13. It allows you to be you again and live your life to the fullest! Medical cannabis is legal in the District of Columbia and open to all DC residents for the treatment of any condition. Copyright © 2019 Herbal Alternatives.